The oldest and most important Jewish community in the former kingdom of Navarre. When Alfonso the Valiant captured the city from the Moors in 1114 it contained a large number of Jews. As they were mentioned after the Moors and the Christians in the "fuero" granted them in 1115 by the conqueror, and suspecting that their safety was threatened, the Jews decided to emigrate; and only at the special request of Alfonso and on his promise that they should be granted municipal rights similar to those of Najera, did they consent to remain. As they continued to suffer much from the hatred of the Christians, they declared to the king that they would be obliged to leave the city if these abuses were not checked; whereupon Sancho the Wise in 1170 confirmed all the rights which Alfonso had granted them. For their greater security he even assigned to them the fortress as a residence and freed them from the tax on merchandise ("lezta"). He permitted them freely to sell their houses located in their former Juderia, and allowed them to establish a cemetery outside the city. He also showed tolerance in his regulation of their legal status (comp. Kayserling, "Gesch. der Juden in Spanien," i. 197). Like his grandfather, who had for his body-physicians the Jews Don Joseph and Don Moses Aben Samuel, Sancho also had a Jewish physician, named Solomon, to whom he not only granted baronial rights in thewhole kingdom, but also gave farm- and vine-lands in two villages near Tudela. Further, in 1193, a few months before his death, he granted Solomon also proprietary rights in the bath located in front of the Albazares gate. In Feb., 1235, Tudela was the scene of a rebellion against the government, when many Jews were wounded and several were sacrificed to the rage of the populace. Peace was restored only through a treaty between King Theobald I. and the city council (Kayserling, l.c. pp. 200 et seq.). The shepherd persecutions of 1321 really began in Tudela. About 30,000 rapacious murderers fell upon the Jews in Tudela, killing many of them. When, some time later, 500 (or, according to other accounts, 300) made another attempt to surprise the Jews, they were overcome by a knight who lay in wait for them. Out of gratitude to Providence for their escape from this danger the wealthier Jews endeavored to alleviate the condition of their coreligionists who had suffered from the persecutions. They collected grain and oil in storehouses, and supported poor Jews therefrom for a period of three years. In the great persecution of 1328, during which 6,000 Jews perished in Navarre, those of Tudela did not escape. 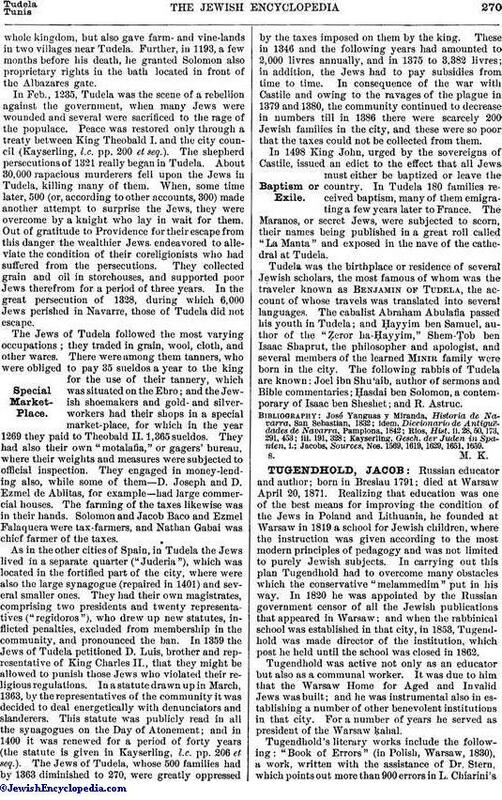 The Jews of Tudela followed the most varying occupations; they traded in grain, wool, cloth, and other wares. There were among them tanners, who were obliged to pay 35 sueldos a year to the king for the use of their tannery, which was situated on the Ebro; and the Jewish shoemakers and gold- and silver-workers had their shops in a special market-place, for which in the year 1269 they paid to Theobald II. 1,365 sueldos. They had also their own "motalafla," or gagers' bureau, where their weights and measures were subjected to official inspection. They engaged in money-lending also, while some of them—D. Joseph and D. Ezmel de Ablitas, for example—had large commercial houses. The farming of the taxes likewise was in their hands. Solomon and Jacob Baco and Ezmel Falaquera were tax-farmers, and Nathan Gabai was chief farmer of the taxes. As in the other cities of Spain, in Tudela the Jews lived in a separate quarter ("Juderia"), which was located in the fortified part of the city, where were also the large synagogue (repaired in 1401) and several smaller ones. They had their own magistrates, comprising two presidents and twenty representatives ("regidoros"), who drew up new statutes, inflicted penalties, excluded from membership in the community, and pronounced the ban. In 1359 the Jews of Tudela petitioned D. Luis, brother and representative of King Charles II., that they might be allowed to punish those Jews who violated their religious regulations. In a statute drawn up in March, 1363, by the representatives of the community it was decided to deal energetically with denunciators and slanderers. This statute was publicly read in all the synagogues on the Day of Atonement; and in 1400 it was renewed for a period of forty years (the statute is given in Kayserling, l.c. pp. 206 et seq.). The Jews of Tudela, whose 500 families had by 1363 diminished to 270, were greatly oppressed by the taxes imposed on them by the king. These in 1346 and the following years had amounted to 2,000 livres annually, and in 1375 to 3,382 livres; in addition, the Jews had to pay subsidies from time to time. In consequence of the war with Castile and owing to the ravages of the plague in 1379 and 1380, the community continued to decrease in numbers till in 1386 there were scarcely 200 Jewish families in the city, and these were so poor that the taxes could not be collected from them. In 1498 King John, urged by the sovereigns of Castile, issued an edict to the effect that all Jews must either be baptized or leave the country. In Tudela 180 families received baptism, many of them emigrating a few years later to France. The Maranos, or secret Jews, were subjected to scorn, their names being published in a great roll called "La Manta" and exposed in the nave of the cathedral at Tudela. Tudela was the birthplace or residence of several Jewish scholars, the most famous of whom was the traveler known as Benjamin of Tudela, the account of whose travels was translated into several languages. The cabalist Abraham Abulafia passed his youth in Tudela; and Ḥayyim ben Samuel, author of the "Ẓeror ha-Ḥayyim," Shem-Ṭob ben Isaac Shaprut, the philosopher and apologist, and several members of the learned Minir family were born in the city. 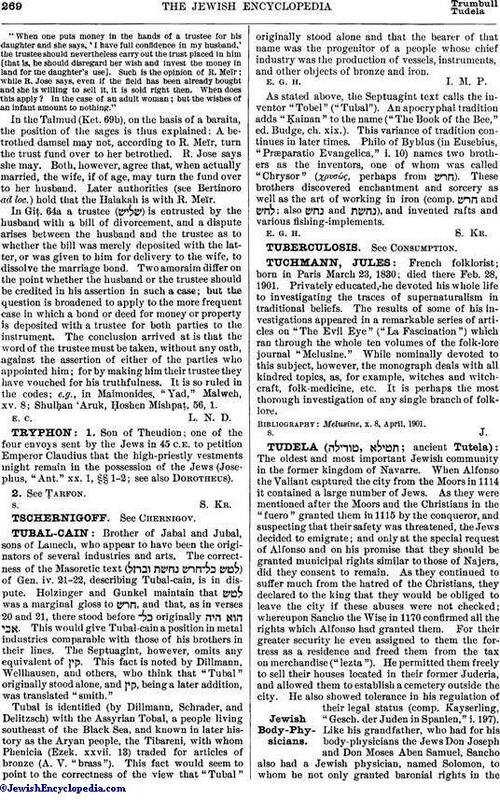 The following rabbis of Tudela are known: Joel ibn Shu'aib, author of sermons and Bible commentaries; Ḥasdai ben Solomon, a contemporary of Isaac ben Sheshet; and R. Astruc. Jacobs, Sources, Nos. 1569, 1619, 1629, 1651, 1659.